Describing the Kharma Elegance S7-S Signature as an elegant and expensive floorstanding loudspeaker is technically accurate, for, indeed, that is what it is. But once your eyes really begin taking it in, examining every exacting line and curve, every flawless detail, that description almost seems an injustice. There’s a slight otherworldly vibe about the S7-S. The exterior finish is a bit too deep, the heavy nameplates and impeccable chrome trim a little too lustrous. Something akin to obsession is suggested by the gently radiused corners of its baffle, the brushed aluminum bell of its port, the skin-tight seams where the crossover plate abuts the back panel—something that sets it far apart from the commonplace. Nonetheless, the Kharma Elegance S7-S is quite obviously a loudspeaker—specifically of the two-way floorstanding variety—in a bass-reflex enclosure with a rear-firing port. It is also the smallest of the four models in the Elegance line. It uses two of Kharma’s proprietary transducers: a one-inch beryllium-dome tweeter inset within a robust surround and discretely angled baffle, and a seven-inch, ultra-high-modulus (UHM), carbon-fiber mid/bass driver (the Kharma Omega7) that represents a sea change from the familiar ceramic cones of earlier Kharma models. In conversation, Kharma’s Charles Van Oosterum describes the UHM cones as the stiffest in the industry and “a real challenge to work with.” He credits FEA (finite element analysis) for playing a large role in optimizing the diaphragm’s shape so that first breakup resonances are pushed as high in frequency as possible. Its voice coil is an “underhung” design (wherein the height of the coil is less than the height of the magnetic gap), lowering its inductance, and, hence, producing a “faster,” more responsive driver. An underhung voice coil is also more linear at higher excursions because the coil doesn’t leave the magnetic flux field at either end of its travel. The crossover point is 2.25kHz, but Van Oosterum adds that this proprietary network uses neither a strict first- or second-order filter but something in between. The enclosure is a visual tour de force. It’s constructed from 35mm of heavily braced, high-quality MDF. Internal damping materials are made of a high-density cellular foam with a patented top layer that improves mid- and low-frequency absorption. The cabinets are actually hand-treated with this compound, which is said to effectively silence vibrations by “optimizing the complex interactions among the back-radiated energy of the drivers, the enclosure, and the baskets of the transducers.” The cabinet’s finish is an ophthalmologist’s dream—so clear you could pass an eye test reflected in it. Of course, you’re dealing with a nineteen-coat process that includes three layers of impregnation, five layers of grinding, three layers of color, and eight layers of clear-coating, after which the entire cabinet is hand-polished to its otherworldly sheen. A wide variety of standard colors is offered, as well as any color on demand. The S7-S that Kharma supplied for this review was the hot-rodded Signature version, which includes Kharma’s own silver wiring throughout (the company maintains its own exclusive line of cables) and various internal hand-applied tweaks. Other flourishes abound, including heavy clamping-type speaker terminals reminiscent of the Cardas versions. These only permit spade connectors, but are very secure and apply excellent pressure. For stability Kharma employs its Spike Disk Suspension System (SDSS)—outrigger footers that are unique to the Elegance Series and works of art in themselves. These footers are pre-installed and integral to the cabinet’s structure. SDSS is made of composite materials with adjustable spiked feet capable of angling the speaker back slightly for dialing in time alignment—an adjustment I took full advantage of in the closer confines of my smallish listening space. Even the aluminum-framed grille is no afterthought—it’s masterfully assembled and attaches via embedded magnets so that there are no holes tapped into the baffle. For a two-way design in this price range, the Kharma rubs elbows with some elite competitors—some larger, some three-way. Thus, it has a very high sonic bar to clear. To be honest, you would think that by now every last drop had been squeezed from the venerable two-way design. But boy, you’d be wrong. From the get-go there’s no missing where the S7-S’s sonic strengths lie. Transparency is its calling card, pure and simple. For me this criterion (in partnership with resolution) is shorthand for the essence of the high-end experience—the ability to convincingly portray musicians playing live music in an acoustic venue. And that convincing illusion is what the S7-S conjured up on every one of my reference musical selections. Stravinsky’s Pulcinella [Argo], a go-to chestnut, is harmonically dense, rhythmically various, and wryly humorous. The S7-S reproduced each instrument clearly without smearing or veiling. It even managed to convincingly reproduce the weight and bluster of the raucous trombone and bass-viol duet—no easy feat. Solo piano, perhaps the single most difficult full-range instrument to capture accurately, was utterly of a piece from one end of the soundboard to the other. There was no shift in character or narrowing of perspective, and zero congestion in the higher octaves, even in the face of the attack transients of some highly percussive playing. As I listened to the spare arrangement of Lyle Lovett’s “Baltimore,” I was transfixed by the way the acoustic guitar seemed to swallow the microphone and the resultant waves of warm air radiating off the soundboard. Equally affecting was the sheer authenticity of the row-by-row layers of handclaps from the live crowd in Bilbao, Spain, during Joan Baez’s “Ain’t Gonna Let Nobody Turn Me Around” from Diamonds and Rust in the Bullring [Analogue Productions]. The S7-S even exposed the odd studio mishap—someone slamming a studio door at the end of Evgeny Kissin’s performance of the “The Lark,” for example, or a poor tape edit, or a late vocal punch-in. 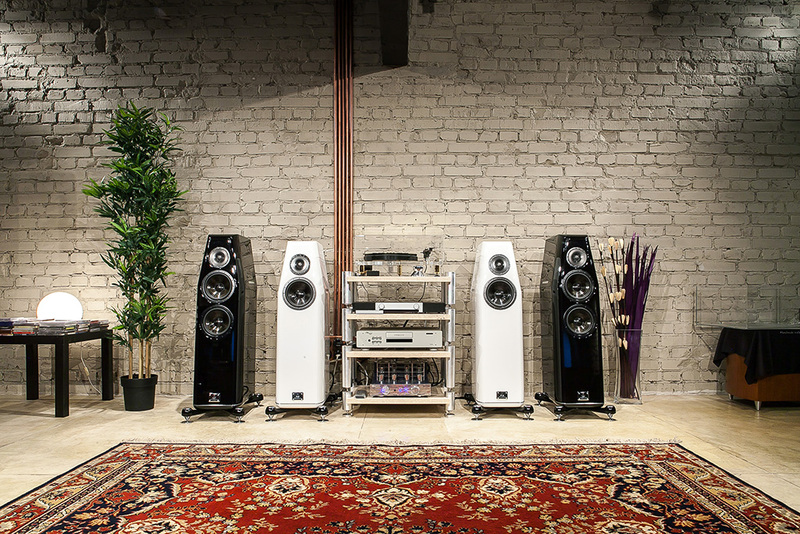 Cues such as these were emblematic of the S7-S in full song: a loudspeaker with a more immersive and open personality than previous Kharmas of this size. Tonally, the S7-S’s character was well balanced with a ripe, warmer cast and a nicely supportive low end. The soundstage it produced was firmly weighted and fully continuous, with an intensely detailed midrange and treble. There were no overt suckouts in the all-important upper bass, nor did the S7-S veer toward beaminess as it ascended to the upper octaves. 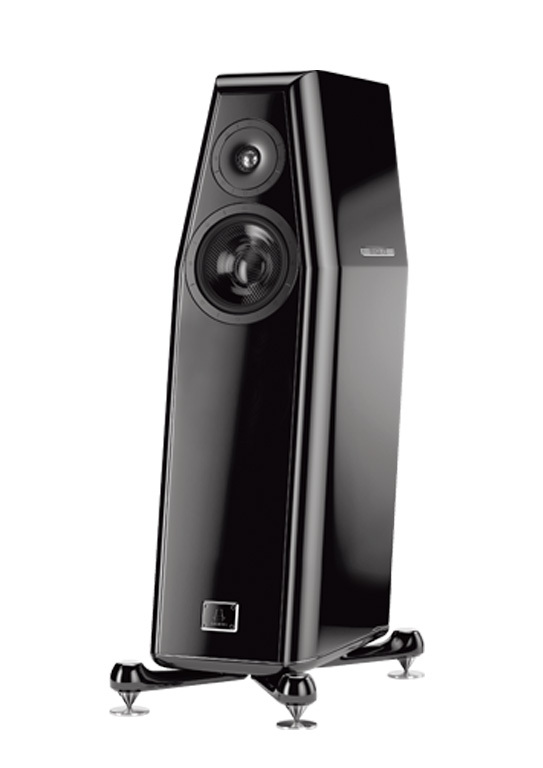 The beryllium tweeter was fast and extremely high in resolution without adding its own texture. (There was a small hint of the dryness common to this dome material, but there was no mistaking the S7-S for a more clinical and aggressive studio-monitor-type speaker.) Inter-driver coherence was excellent, with absolutely no sense of driver localization. Listening perspective was a few rows back from the front, a location that added to the drama of symphonic depth and dimension, but occasionally seemed to soften the energy and drive of contemporary pop and rock. The S7-S dug deep in the bass, as well. I was getting rock-solid in-room response in the 40Hz range and substantial output into the mid-30s—not true subwoofer territory (the S7-S won’t rupture a fault line) but impressive on both a quantitative and a qualitative level. Without blinking, this Kharma peered deeply into the windy bell of the baritone sax during Jen Chapin’s cover of the Stevie Wonder hit “It Don’t Mean Nothing” [Chesky]. Its bass response was composed, but not leaned-out in a pitch-differentiation-only way. The S7-S had a wider range of expression than that, accurately characterizing timbres from standup bass to Fender bass, piano, organ, and heavyweight winds. The S7-S shone most intensely with orchestral music. Whenever I dialed up a naturalistic volume, images and dimension came alive with the angles, light, reflections, and complexity of a Vermeer. It’s a rare loudspeaker of any size or driver configuration that has the resolution to map the contours of a recording venue like the Kharma can. It not only revealed the acoustics and immersiveness and sweep of symphonic venues; it also exposed the veil of artifice of contemporary commercial and pop recordings. You could almost peer into the recording studio where The Carpenters recorded platinum hits like “Close to You,” and see knobs being twisted to punch up a vocal, faders rising and falling, the application of varying amounts of reverb to dry off or wet down specific tracks. One of the most exhilarating aspects of listening to music through the S7-S was the degree to which it operated outside its box. Such observations are commonly reserved for small two-way, stand-mounted monitors, which are renowned for vanishing into the listening space, revealing little of themselves and everything about the music. However, even elite mini-monitors perform this disappearing act at the cost of highly restricted acoustic output, squeezed dynamics, and limited low-end extension. The S7-S’s magic is that it encapsulates the ethos of the mini-monitor—“no localization allowed”—but does so across a vastly wider frequency spectrum. In my room, the complex and varied transients and resonances of bass drum and timpani originated in precise spatial formations. During Vaughan-Williams’ The Wasps Overture [RCA] the percussion players lined up at the rear of the orchestra (and just forward of the hall’s back wall) came into strong focus, with the layers of string sections spread across the stage in front of them. What you didn’t hear was the S7-S’s cabinet, or its drivers, or its rear-firing port. In an era of new and exotic cabinet materials, the S7-S is a tribute to Kharma’s long experience honing the traditional enclosure. To my way of thinking, a large portion of my sonic impressions are owed to Kharma’s superb new mid/bass driver, which combines a muscular midrange balance with the sinewy, fast-twitch transient response that Kharma’s ceramic diaphragms were so famous for. The new driver is a major leap over its predecessor. This isn’t a negative referendum on earlier models, but my take was that these efforts, though ultra-refined, could also sound a bit fragile, even brittle, and seemed to be biased toward lighter more delicate music, shying away from the heavier macro-dynamics of large-scale music. Back in the day, I was truly in awe and admiration of a Kharma’s resolving power but not as emotionally moved by it. The UHM mid/bass has changed that. The Kharma may very well be the zenith of the two-way floorstander, but it still has its limits, modest though they are. It will be at its effortless best in medium-sized to smaller spaces where it can tap a little extra low end via wall reinforcement. I mentioned earlier the slightly distant audience perspective, and have concluded that there is a narrow frequency dip in the presence range that softens energy there a bit. In addition, larger dynamic swings tend to soften a little sooner than they do with larger multiways. Bass excursions, while taut and controlled in the midbass, lose intensity further down. For example, there was a little less resonance and decay from the talking drums’ during Jennifer Warnes’ “Way Down Deep.” (These drum-skin cues were immediately recaptured in all their rippling glory with the addition of a capable subwoofer like the REL S/5 [Issue 252]—a great match with the Kharma for those seeking the last word in bass extension. Kharma makes a matching subwoofer in the Elegance line, which I haven’t heard.) The Kharma Elegance S7-S Signature is on a very short list of the world’s most musical, luxurious, and sophisticated speakers. And I have to tip my hat for the elegant way it takes its place on that list. It serves as a reminder that sometimes we don’t merely own a high-end component just to listen to, but also for the sheer pleasure of its company. We all can’t afford an S7-S, but I wish every audiophile could have the opportunity to hear one. That’s what I would call spreading around a lot of good Kharma. Graham Audio LS5/8 loudspeaker review (Hi Fi +) Chartwell presenta il diffusore LS3/5!